After a minute or so, looking into the mirror, with moving her face in almost all degrees and eyeing her look especially her long and newly straightened hair falling over her right shoulder uptill her midriff, she left a smile. A smile that was bordering on certainty and predictability. Yet she was hopeful that the things will soon fall in place and eventually someone will see her as the apple of his eye. “Beta are you ready?” inquired her mom knocking on the closed door. How ironic it is that in our society, at one end you call your daughter a ‘Beta’ and at other end expect that beta to marry soon to eventually get rid of the burden. A burden of an unmarried daughter sitting at her home and not at her in-law’s. “They must be coming any time now. Please come out quickly. You also need to take the blessings of the God”, ordered and stated her mom for the nth time. Anagha got the hidden message in her statement. The warmness of the hug got crushed under the weight of the hidden message but she maintained herself although her eyes started getting moist. Her heart was at crossroads. She was unable to believe that inspite of coming from an educated family the thinking was still that of an uneducated and fixed to the rigid thought process of yesteryears. She was beginning to feel heartbroken and on the verge of falling into depression unless this meeting turns fruitful and culminates into her marriage. After all those customary greetings, handshakes, talks about all and sundry and after two full days, it turned out that the imaginary bookie of the aunty residing next door had won. Yet again. She felt suicidal as big 30 was looming large in front of her and with ever increasing jibes from family and relatives made her difficult to breathe. But she was not the one to be bogged down. She was a fighter. And one day she had decided to turn the tables. And in she brought her namesake boyfriend with good physique and next-door, good boy mannerisms to floor her parents which he did with ease. And in the meantime bought herself a breathing space. 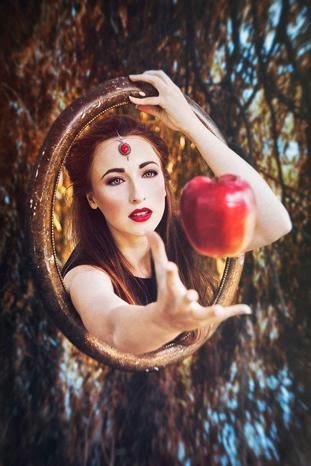 But little did she knew that over time, the so called boyfriend had found his apple of her eye in the form of Anagha whereas she was still dreaming, looking into the mirror and awaiting for someone who will see her as the apple of his eye.